Home cleaning is a catch-all phrase for the general de-clutter and organizational projects that abound when messiness trumps neatness. But in addition to clearing out the garage, don’t forget to change those oft-neglected filters that can harm your health if left unclean. “Humidifier filters, for example, are designed to wick the water and make it easier to evaporate in the air to increase humidity. But, if not changed they can become over saturated and susceptible to mold, mildew, and bacteria growth that can make you sick,” says Alex Hertzog, a water specialist with Filters Fast who is certified by the Water Quality Association. Most of us eventually remember to change the obvious filters, like those on our stove vents or the PUR filter on our tap. But what about changing filters you don’t even know you have? According to the experts, there are seven filters you probably don’t know you should be changing. Microwave filter. The filter traps grease and odors from the air, thus protecting the appliance and also preventing odors from recirculating and affecting the taste and smell of your food. The microwave filter should be replaced every 6-12 months. Shower head filter. The filter reduces harmful chemicals that can dry out your hair and skin, leading to other negative effects on the body. It should be replaced every 3-6 months. Humidifier. Most people know humidifiers have a filter that should be changed, but what they don’t realize is that many humidifiers actually have up to three filters. It’s important to change all three filters. Coffee maker filter. A filter is used in most coffee makers, and it should be replaced approximately every 60 brews. “They’re designed to remove the disinfection chemicals from tap water. If the filters aren’t changed, they cause more exposure to ingesting chlorine,” says Hertzog. Furnace filter. To reduce allergens like pollen, dust, pet dander, mold spores and dust mites from leaking into the air, it should be changed every 3-6 months. Dryer lint filter screen. The lint filter screen should be replaced as needed, if it has build-up or tears in the screen. Changing the filter can prevent fire hazards, extend the life of your dryer and reduce energy bills. Refrigerator filters. 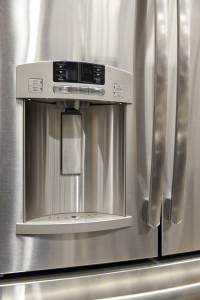 The filter on a fridge keeps ice fresh and cleans the water dispensed from the refrigerator.